There are few fashion week shows that acquire the cult status mostly for what they stand for. As we saw (yeah, okay buffered on the internet), the sixteen years of Marc Jacobs' showmanship at LVMH flashed before us over 41 intricately designed outfits, it made us realize, there is no better way for this term to end. As much as it is a loss that Louis Vuitton would definitely feel considering the energy and the insane contemporary fashion and cultural aesthetics that Jacobs pumped into the Louis Vuitton brand, we wait on the IPO for Marc's own brand Marc Jacobs to begin of which LVMH is also an investor. Like they say, every dark cloud has a silver lining. While reading up on him and fishing out old pieces on his work, I chanced upon this stellar piece here, dated circa last year when Louvre's Musee des Arts Decoratifs saw an exhibition to exalt and juxtapose what Marc Jacobs brought to Louis Vuitton's vision. It makes you realize how important it is to build upon a strong foundation that a brand exists upon. Its equally important to extend that vision into your personal ideas and inspirations as a Creative Director. 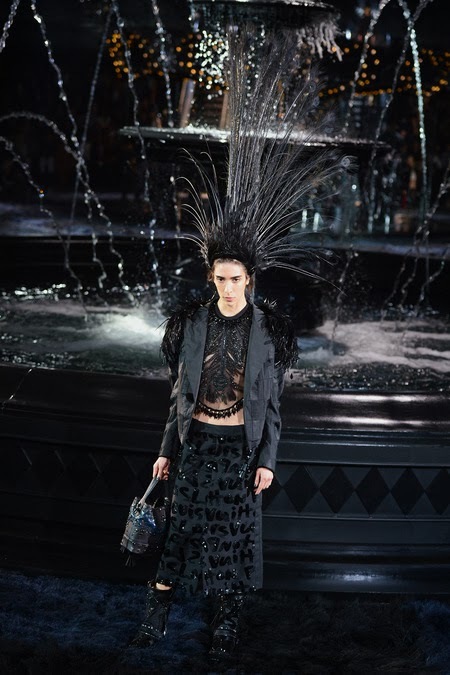 Just what Marc Jacobs brought to Louis Vuitton's strongly cemented foundation from around the time haute couture Parisienne was born can be seen over the sixteen years of highly commendable Ready-to-Wear and the iconic LV-hologrammed leather goods. The show could easily be described in two words: Eerily surreal. While the two words together bring in their individual meaning and elements, as a description they are the ideal match for a gothic glam vanity fair. My favourite piece. Flapper feel to a sporty numbered jersey! To the sixteen years of spectacular shows and bringing that larger-than-life fashion era to Louis Vuitton. To the man who is truly one of the most influential people in the world today. To the showgirl in all of us. Leaving us with some last minute wisdom. Stunning pieces. He left on a high! I hope he goes on the more fabulous things. This collection seems way too much wintery for me !